I need a weekend to recuperate from my weekend! Friday was crazy. Got off work early because my boss and I were both headed to the annual bowling league banquet. Our team decided to rent a 'limo bus' a few hours ahead of time, fill it with snacks, alcohol and loud music, and stop at random bars in St Paul and Stillwater with names like 'No Neck Tony's.' So I had the odd experience of being seated at the loudest, drunkest, rowdiest table during the prizes portion of the banquet. A remarkable number of the people in my team got dwawn for the raffle table, including myself, though by the time I got up there very few choices were left. Needless to say, got home rather late. Saturday afternoon brought me my first full ride on the Light Rail to downtown Minneapolis, which I enjoyed because I got lots of editing done and it's better than taking the bus. My destination was Pantages Theatre for a showing of "The Great Divorce," based on the book by C S Lewis. It was quite interesting and very well acted--90 minutes went by in a flash. After that, I accidentially got on the wrong train and decided to stay on and ride to St Paul, then took the bus from there to my car--lots more time for editing. Since I avoid driving near downtown Minneapolis like it's radioactive waste, it's great to have the train as an option! Sunday was the prettiest day of the weekend, so after church I drove over to the Minnesota Landscape Arboretum and did some walking and driving around. Got to enjoy spring ephemerals though it's still too early for trillums, at least the marsh marigolds were up. The magnolias were still blooming, the forsythia was vivid, and the earliest/most sheltered tulips and daffodils were starting to bloom. Even got to see some fritillaries like in my Triune story! And today is Shado's birthday--he is 12 years old. Never thought he would make it, or be doing so well. Thank you, God! 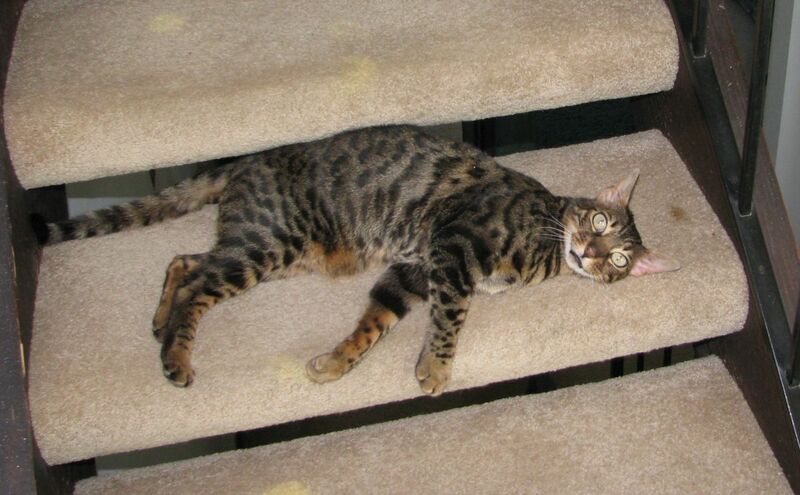 He's very much enjoying the sunlight and warmth making a return, and as you can see he still loves the stairs! Happy Birthday Shado. He looks great in the picture. He's happily enjoying the spring weather and sunbathing outside or in his window hammock, that's for certain!